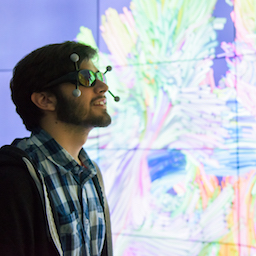 UMBC’s Pi Squared facility is a partial CAVE2 immersive virtual reality environment consisting of a room-sized six-by-four wall of thin-bezel, 3D 1080p monitors, plus an Advance Realtime Tracking (ART) system, and computing cluster. Artists and performers with interests in simulation, augmented reality, virtual reality, projection and performance are encouraged to attend this information session revealing a hidden gem on our campus. Pi Squared is located in room 201B of the Information Technology and Engineering (ITE) building. The initial purchase of the system was made possible with the support of an Major Research Instrumentation grant from the National Science Foundation and generous support from the Next Century Corporation keeps the facility humming.